Yesterday, after the holiday anxiety had passed I decided it was time to face my demons. I took a Marquetry class with Patrick Edwards in late September. The class was absolutely great, but I really struggled with being able to accurately saw the parts out using the Chevalet. Fast forward two months and I’ve built my own personal torture device Marquetry Chevalet. Time to face my demons, I don’t like getting “stuck” on learning a technique or process. First off, I needed to adjust several things on the Chevy for it to work properly. First, the jaws need to clamp tight in the middle and not tough at the sides — by the thickness of a sheet of paper. This is to help with steering the packet, if it clamps most tightly at the edge it will be hard to take a corner at speed. Then I started on adjusting the saw so it cuts square to the rear vise face. I did this by cutting a plug out of a 1/2″ MDF and sliding it through front to back. If it sticks that tells you the blade is out of square. I got it as close as I could, the plug slides through, but it’s slightly snug at the front and loose at the rear. Part of the problem is that the jaws only come together at the top edge. The jaw faces are parallel when open, the rear jaw swings in an arc to meet the front jaw and then connect just at the top. What that mens is the the packet between the jaws can pivot front to back by maybe a quarter of an inch – clamped tight at the top with a 1/4″ or so gap at the bottom. That is what is making the last bit of adjustment tricky, if I let the packet tip while sawing the test plug without realizing it I get inconstant results. I’ll probably experiment with a tapered rear jaw to see if that helps – although I think I have it more than close enough already. After several hours of fussing around with filing the vise jars, moving the adjusters and adjusting other bits I declare the Chevy roadworthy and decide to take a short road trip. I’ll need some supplies and a map. I’ve spent hours searching the ‘net for “marquetry patterns”, including looking at embroidery patterns, stained glass patterns, line drawings that could be adapted, etc, etc. Lots of ideas, but I hadn’t settled on one that was the right balance of “interesting” and “simple”. I finally decided to go with this rose pattern. 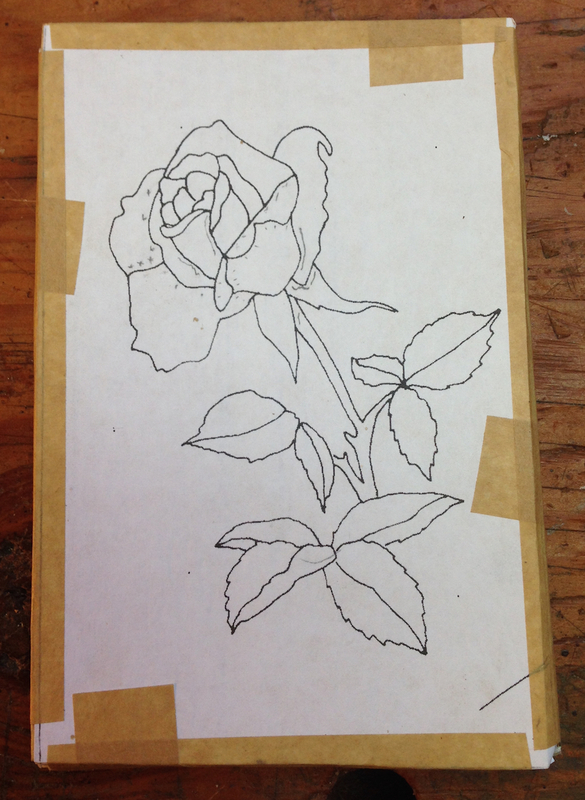 I like the shape, and it seemed “simple enough”, although I wasn’t really seeing the complexity in the middle of the rose. Lots of little bits there. I scaled the pattern up slightly to fit within the 4″ x 6″ veneer samples I bought 20 years ago. I picked Wenge for the stem, Black Limba for the leaves, Paduk for the rose and Rippled Sycamore for the background. There are also 1.5mm and 3mm waster veneer for the front and back of the packet. To start, I had to mix up some hide glue using the glue pot I built last year. First time out, Yeah! I think I had the glue just slightly too thin. Not by much though. I did discover a problem with Hot Hide Glue (HHG in the internet woodworker vernacular), more on that in a bit. I laminated a piece of newsprint to the show face of each veneer to give it a little resistance to splintering while I’m sawing and assembling. I also laminated the pattern to the front waster veneer. I made up a little piece of grease paper by rubbing some industrial wax onto newsprint and folding it over itself (I’ll get some lard or tallow this week, this stuff what on hand but it’s too sticky and clumpy). The packet is assembled for sawing by laying down the thicker “waster” veneer, the grease paper and the first layer of show veneer. These are taped at the edges with veneer tape. Then the next layer of show veneer is added and taped, continuing until the front waster board with the pattern glued on is added and the edges are wrapped with tape. For the process we did in the class, using a paper-covered assembly board, the show face of the veneer with the newsprint lamination I added needs to go down. The final image will be a mirror of the pattern on the front of the packet. Unfortunately, we’ll come back to that too. So, in the class my nemesis was the sawing. My cuts were “lumpy” and wove back and forth around the line like a drunken teenager learning to drive. So it was with no small amount of trepidation that I climbed into the seat on the Chevy put on my turn signal and checked over my shoulder for the highway patrol. Honestly, the sawing went great. I had Lightnin’ Hopkins cranked up and just took my time. The cuts weren’t perfect, but it’s subtle things. A tiny bit off the line here, an inside corner that should be sharper there. I’m using the finest 2/0 Escargot fret saw blades because that’s what seems to give me the best control. I need a 5X magnifier to see that there even teeth on it. The trickiest part of the sawing sometimes is getting the tiny little bits out of the packet when they are cut free without losing them. 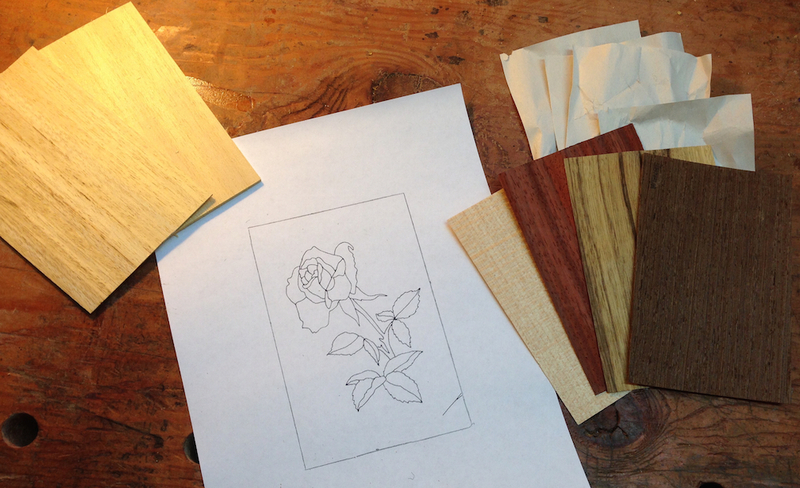 There are a lot of process steps to doing Marquetry successfully. Patrick would yell at me if he saw the pile of parts above, and I’m going to follow his instruction on the next project. What’s wrong with it? First, I should immediately throw away any layers I know I’m not using. If it’s part of a leaf then I only need the Black Limba piece, the grease paper, waster veneers, Wenge, Sycamore and Paduk should all go in the trash immediately. Second, the parts should be laid out neatly according to the pattern as they come off the saw. They are close, but not quite right. One of the goals is to handle the parts as few times as possible. With about 40 pieces in this little picture, having and extra 120 pieces mixed in isn’t doing me any favors. About half way done sawing. I’m using tape to reinforce areas that are not well supported after removing parts. Once all of the parts are sawn out I decide to checkout the overall effect. On a copy of the pattern I set out each individual part, sorting through the little disorganized piles. Next time, I’ll only keep the bits I need and I’ll keep them in proper relation to each other. All the parts cut out. Normally at this point you would think about sand shading the parts and then assembling. I’m skipping the shading for this exercise. Up to this point things have gone reasonably well. If you like stories with happy endings you might want to just skim from here on and assume you’re the Fairy Godmother to my Cinderella. There are a lot of processes here that I need to figure out and get dialed in to work in my shop. Setting up the pattern board (special kraft paper stretched over a backer board), HHG, sawing, sand shading, assembly, filling the gaps with mastic. I decided to skip the sand shading as I didn’t have the sand and was eager to see the first sample through to completion. I had the assembly board set up, and in the space of 30 seconds ran into to serious problems. I brushed the kraft paper on the board with HHG, and placed the background onto the board. Problem 1, it was cold in the shop (maybe 45 or 50 degrees) and the glue started to set almost immediately. I had the background partly stuck in the glue when I realized this. I pressed on, applying little bits of glue in an area and then putting another piece in place. But it was fighting me the whole way. Parts weren’t sticking properly, other than to my fingers. Then I picked up the next piece in the assembly order and it popped out of the tweezers (my hands were cold), flipped end-over-end, fell through one of the bench dog holes and landed somewhere in the dark nether reaches under my bench. After ten minutes of crawling on the floor I gave up on finding it. I put the nearly-complete assembly in clamps and went inside for dinner. 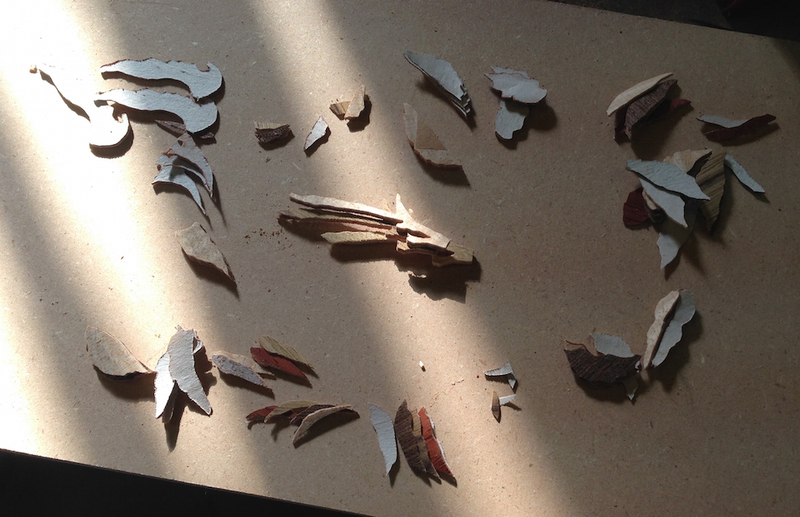 On my way, I realized mistake #2, I assembled the marquetry upside down. It should be face-down at this point, but it’s face up, showing the newsprint veneer. So three problems. How do I keep the HHG from going off so quickly? Probably warm the assembly board and heat the shop. 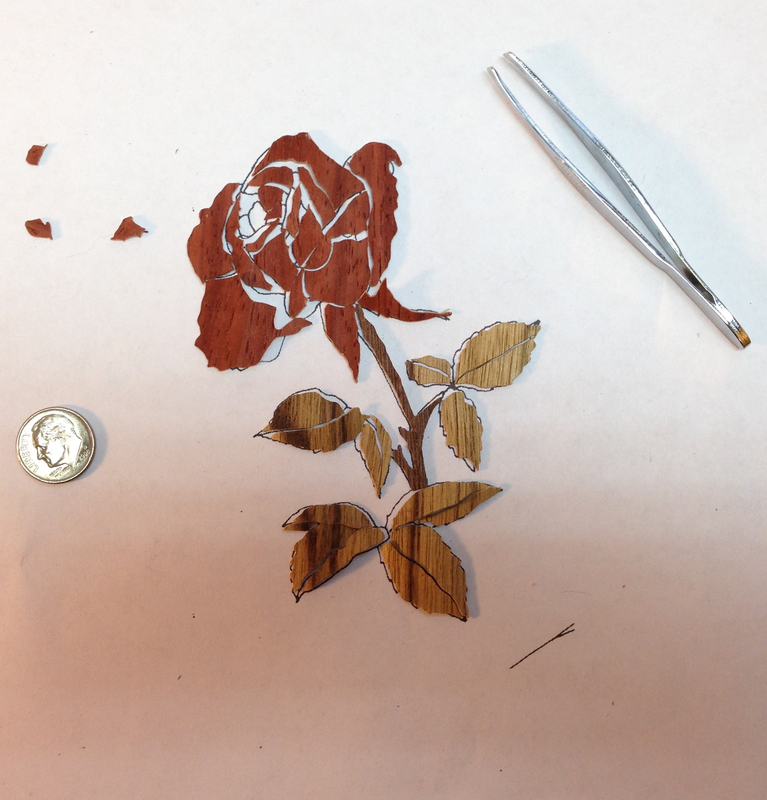 Or wait until summer to do more marquetry. The assembly reversal is just a brain fart on my part, with enough self-recrimination I’ll probably avoid that in the future. The missing piece of marquetry I could probably patch, but I’m on the fence in terms of trying to repair this now. Another piece pulled off from clamping, and a couple of pieces are loose. I’ll have another cup of coffee and stare at it a while.. It doesn’t look like much at this point, but it was only intended to be a learning exercise. Try and fix it, or see how far I can throw it? Great job!!! I recommend making some drawers for the marquetry. You can find blue craft foam at art supply house that work great for a lining. I would put a white melamine on the bench and sweep the floor before starting. I now use plastic glue bottles for my hhg, gives me more control of amount and location. But for the first run at it on your own great job!!! I also have several assembly boards ready to go for its always frustrating needing to stop or if something goes wrong in the process of the assembly board. I would get those propane heaters and warm up the assembly boards, mdf holds heat for a while. Too bad you don’t llive closer for we could work together in getting everything spot on. Good luck!!!! 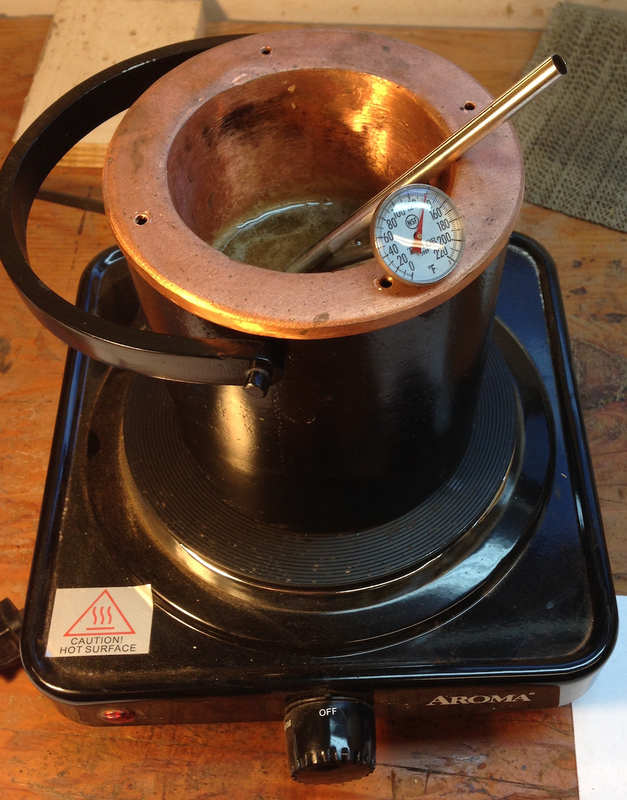 I think my problem is all about the shop (and part) temperature. HHG cures first by temperature then by evaporation, I think that’s what makes “rub joints” possible. It was flashing off as I put it on the assembly board. Heating up the shop and warming the board would probably solve the problem. That’s my plan for now anyway. Since it’s already upside down – why not stare at it for an extra 10 minutes and complete it as is? It’s a practice run and you’ve already beat yourself up for the brain fart. 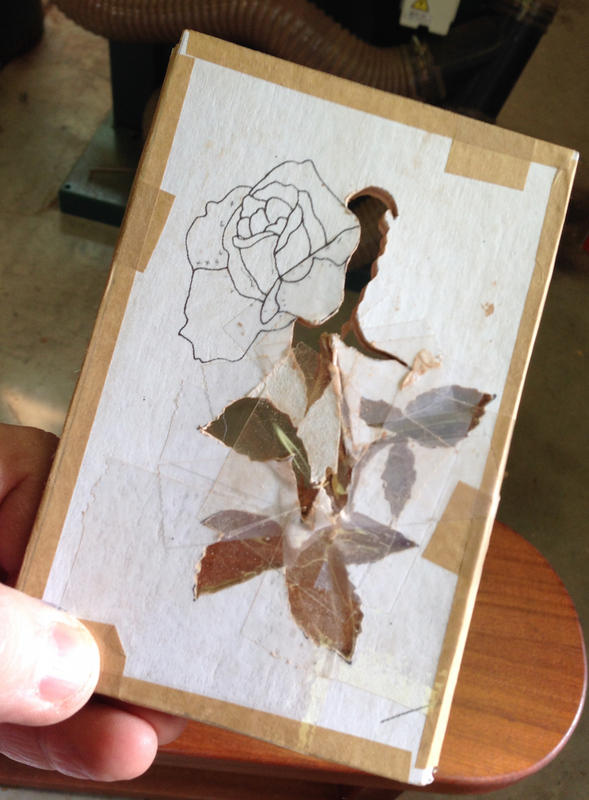 I want to see how the rose looks. I could cut a couple of replacement pieces and glue them in, and probably iron the ones that are lifting back down — are you thinking to finish it as it sits on the pattern board (it’s just glued down to paper), or cutting it loose, flipping to over and glueing it down to a piece of wood? To be more clear (or at least less confusing), the side you see in the last picture it the face side. I’m torn between trying to moisten and scrape the newsprint off (and have the kraft paper on the assembly board get wonky) versus trying to get the think successfully flipped over and glued to a piece of wood. Thinking about it (it helps me to talk this through) it’s probably best to patch it and carry the rest of the process through as it’s supposed to work. The piece won’t be right, but maybe I’ll learn something else. As they say…no pain no gain! Hey Joe, the best thing is now you’re working on marquetry projects. You’ll sort out and smooth the bumps out along the journey. Have fun with it. Looking forward to the evolution/progress in your work. Shipwright on Lumberjock is first using (low?) sticking paper. http://lumberjocks.com/stefang/blog/42309 : see also comment by Shipwright. Why discarding the other pièces, you can make “negative” copies of the original with them. If you have more than 2 colors you have additional options. I noticed Shipwright (Paul) using shelf paper. I was trying to follow the same process as we used in school. It worked fine there, but it was 30 degrees warmer in the classroom too. I may try the shelf paper in the future, I can see how it might have some advantages. 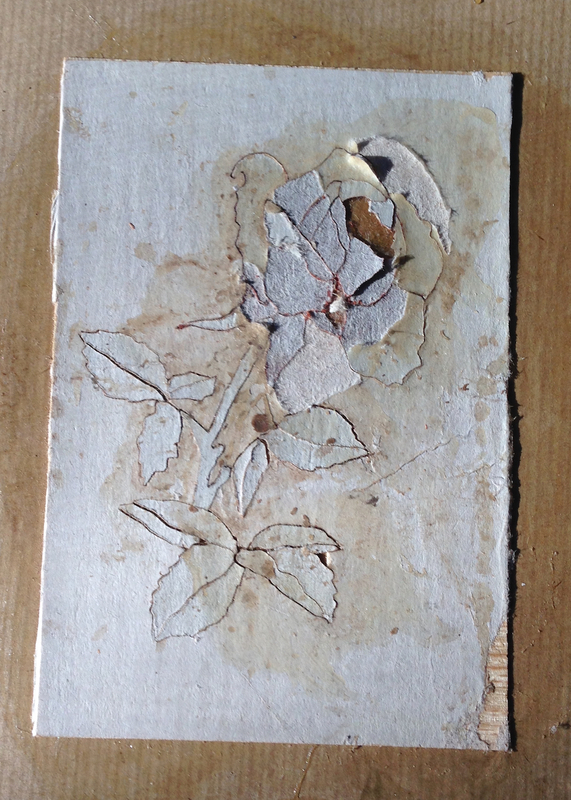 I threw away the extra pieces because I didn’t want to make a negative image of this particular piece. I started setting up another veneer stack with this same image with the goal of getting two complete pieces out in the end. I might try assembling a “contra-parte” but it’s a lot more “piece management”. I’m just taking my first baby steps here, making mistakes and figuring out how to do this kind of work. Mostly, I’m trying to put into practice the exact process we used in class. Once I have my sea legs I’ll evaluate where I’m at in terms of process. One of my goals for this year is to get “competent” at Marquetry. That means I’m going to have a number of screw-ups to work through and I’ll produce a number of ham-fisted practice projects along the way.